Shortly after the last 500 Superfast was made, the 365 California was announced as the model’s successor. 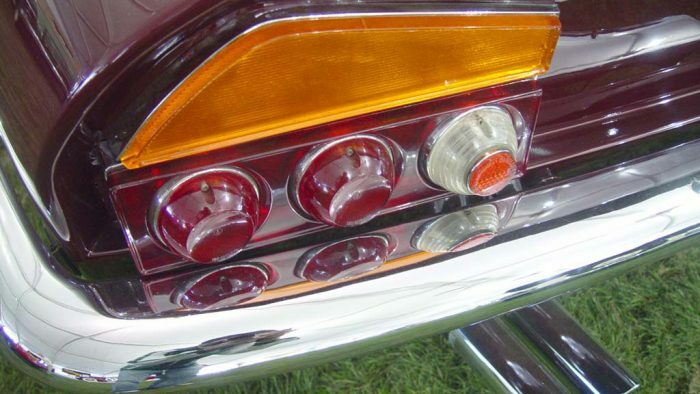 It was the continuation of a series of limited production cars which included the 410 and 400 Superamercas. These cars were marketed to attract premium customers who demanded a more unique coachwork on their grand touring machines. 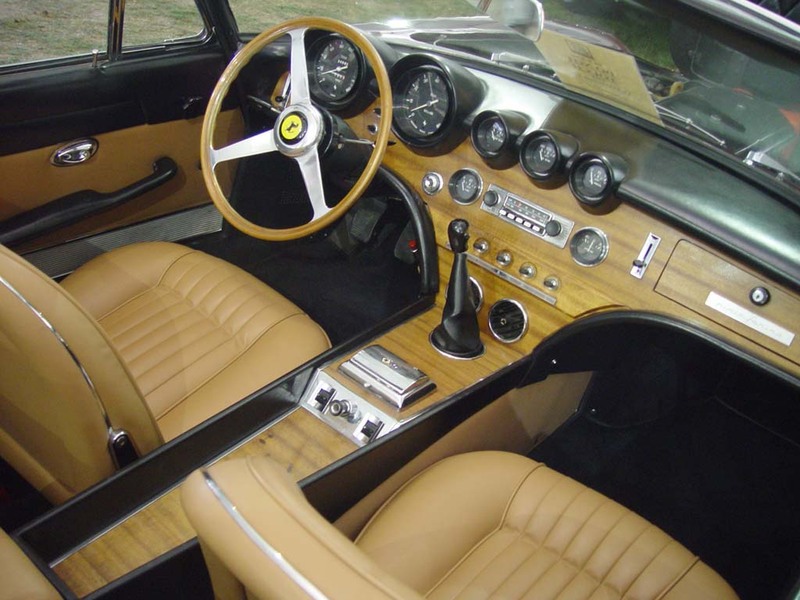 To keep costs down, but exclusivity high, the 365 California was only offered to select VIP clients of Ferrari. 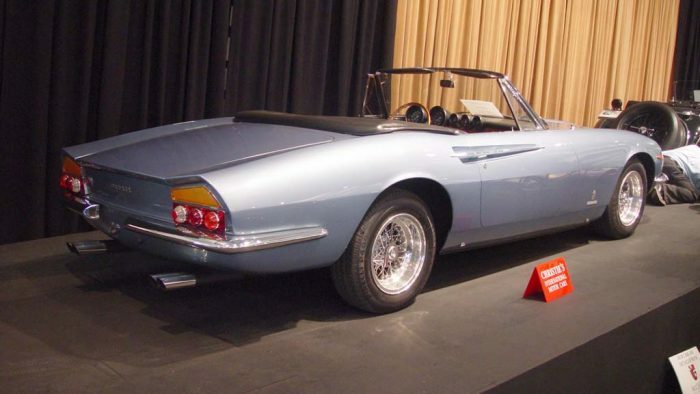 To much success, the California title had been already been associated with the earlier 250 GT Series. Around one hundred 250 California Spyders were built with some light alloy competizione examples actually racing Le Mans and Sebring. 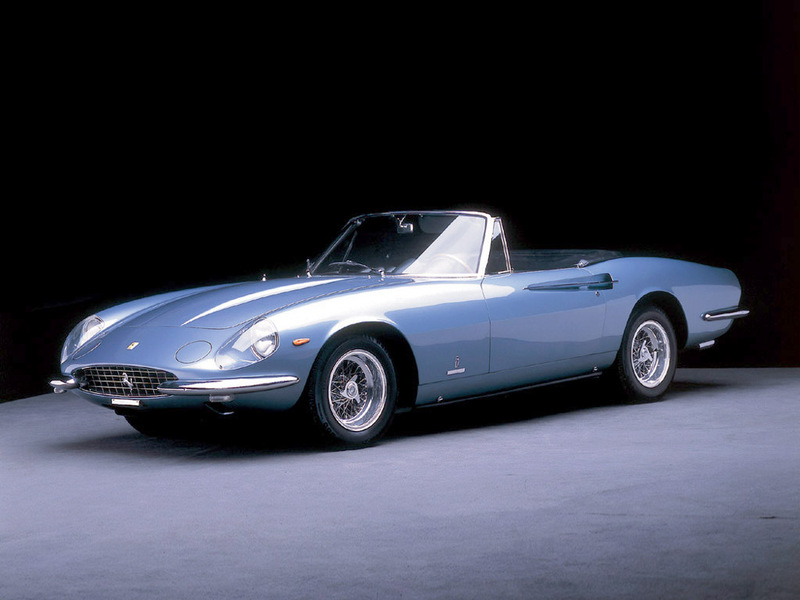 Drawing on this rich heritage, Ferrari decided that new 365 Spyder would be marketed as the next California model. Much like the 250, this 365 used a well developed chassis to provide a basis for the next California Spyder. Released alongside the 330 GTC at the 1966 Geneva Auto Salon, the long and low 365 California Spyder was basically a reworked 330 GT chassis featuring a striking Pininfarina body. As far as engineering was concerned the 365 California Spyder was uninventive, having a wishbone front suspension and live rear axle held by leaf springs. Powering the 365 was a Columbo long block V12. 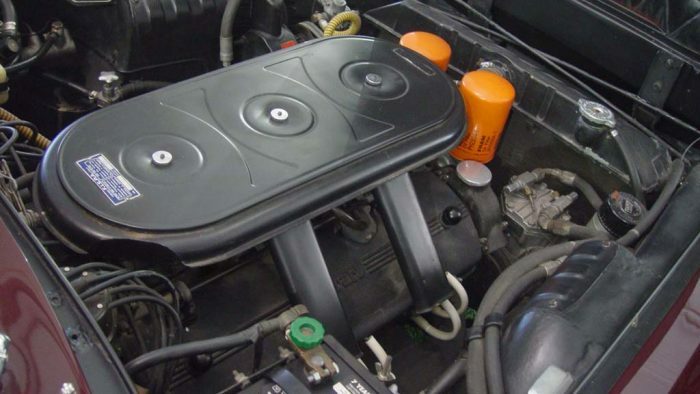 This engine was common in the 365 range, being an enlarged version of the unit found in the 330 GT. 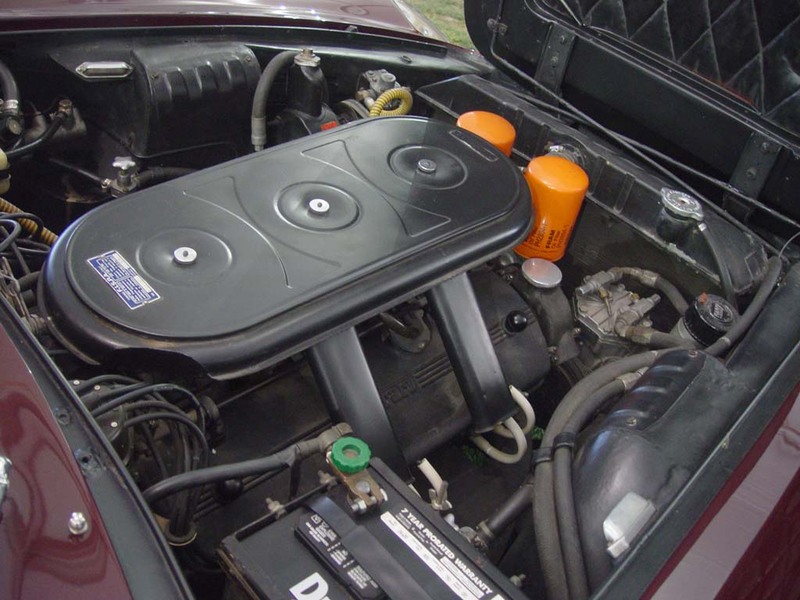 Other evolutions of this engine powered the 365 GTB/4 Daytona, GTC/4 and standard 365 GT coupe. The area in which the Spyder was the most developed was styling. Most of the costs associated with the project went into designing and building an appropriate form that could carry the evocative California name. Working for Pininfarina, Tom Tjaarda was responsible for styling of the 365 California. He used a culmination of design cues from the 500 Superfast and 330GTC to create a harmonious cabriolet of grand proportions. Unique elements to the car include its covered headlights, popup driving lights and door handle treatment which faked a mid engine air intake. Especially unique was Tjaarda’s treatment on the rear area on the car which was a departure from Ferrari’s traditional design language. The rear was very angular and even payed homage to the Kamm tail as found on cars like the 250 GTO and Breadvan. In total only 14 examples of the 365 California were made. Each featured the identical bodywork which kept the already high production costs down. 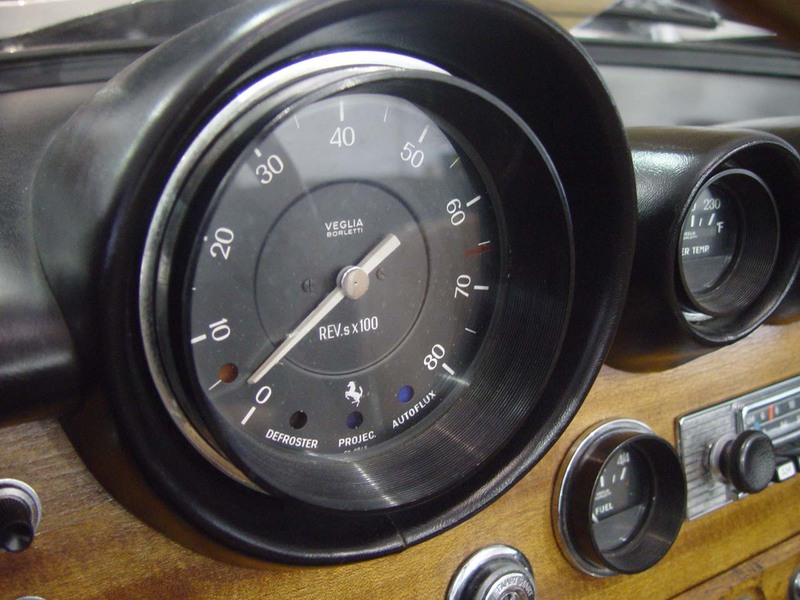 The limited production run can be attributed to such costs and the fact that Ferrari wanted keep this model exclusive, much like the 500 Superfast. 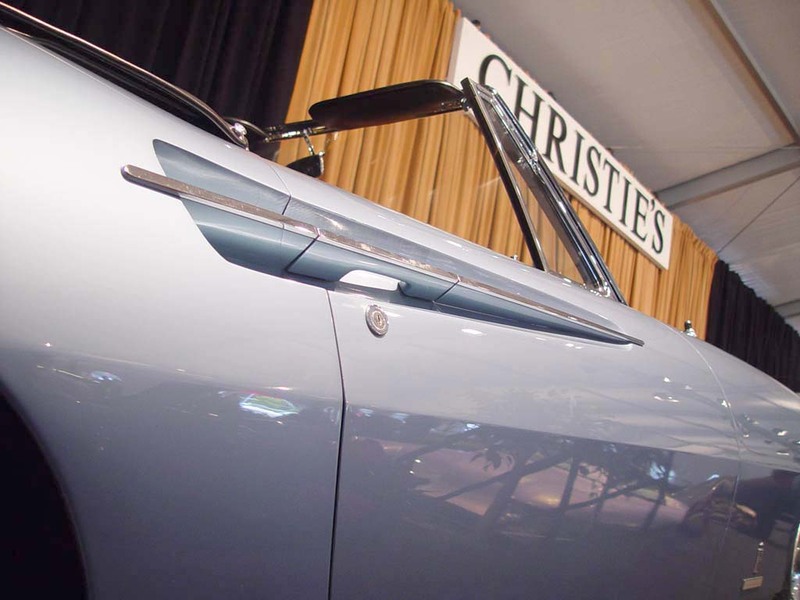 During their sale of exceptional motorcars at the Pebble Beach Equestrian Center, Christie’s auctioned chassis number #9889, the light metallic blue car seen above with black leather interior. Being a very original car with 20,350 miles on the odometer, the cat fetched $634 500 USD. 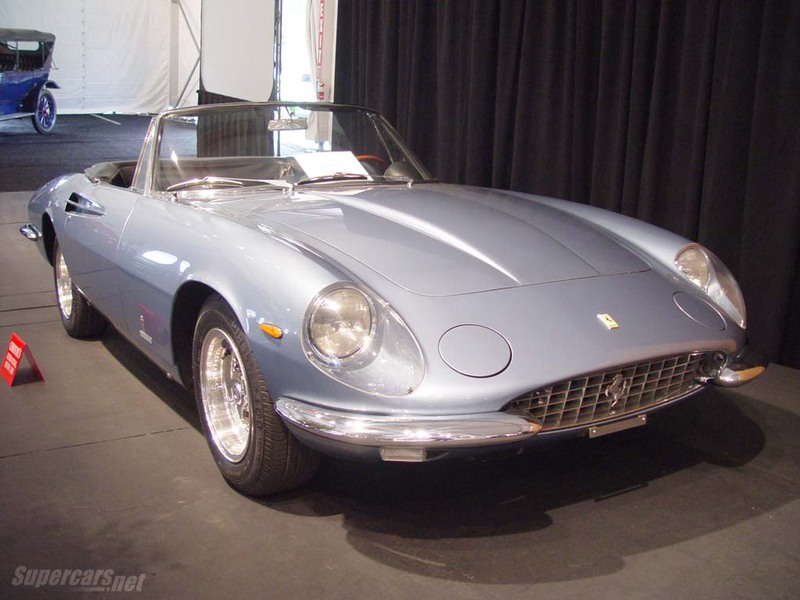 1966 Ferrari 365 California Spider 9631 – sold for $880,000. This elegant 1966 Ferrari 365 California Spider, chassis 9631, was selected for display on Pininfarina’s stand at the Geneva Motor Show on March 9-19, 1967. Immediately following its Geneva debut, 9631 was flown to the US where the well-known Ferrari importer, Luigi Chinetti Motors, proudly took the delivery in late March the same year. 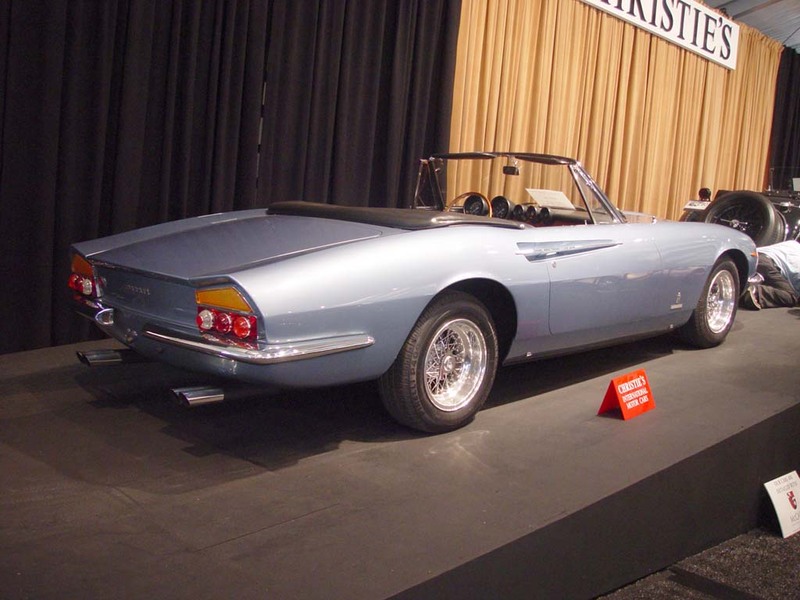 For its second show appearance, it was displayed on Chinetti’s stand at the 1967 New York Auto Show, held in early April at the Coliseum. In May that same year, this sensational show car was leased through the Transamerica Car Leasing Company to its first caretaker, a doctor believed to be from the New York area. 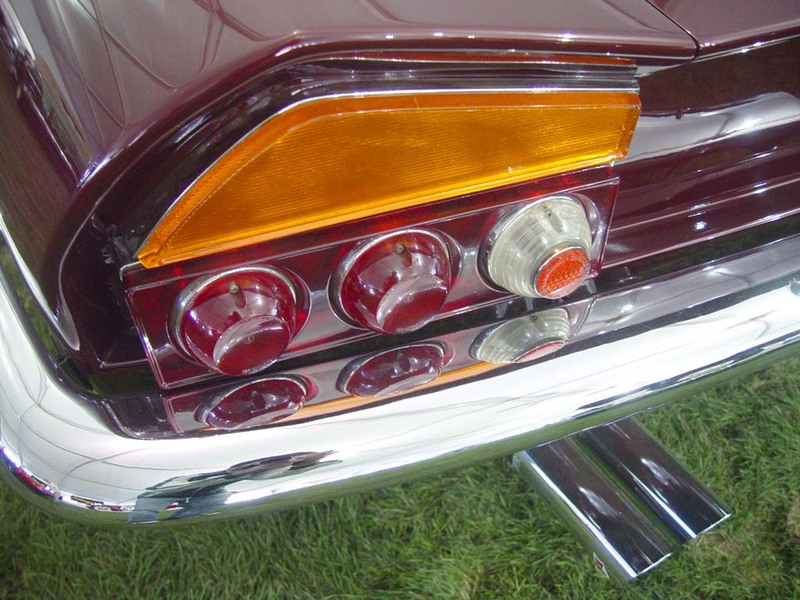 It remained registered to Transamerica until April 1971 when a Mr. Fred Sweet purchased the car. Shortly after, William Nicholson of Seattle, Washington, acquired this Ferrari. 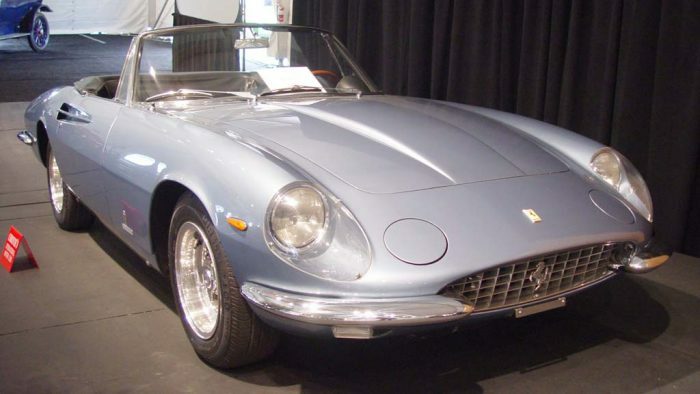 In 1976, this California Spider became a part of another Seattle-based collection when it was acquired by Sam Allotta. Not long after Mr. Allotta had purchased 9631, it was involved an unfortunate accident when it was hit in the rear while parked on the side of the road, damaging both the rear and front of the car. Understandably, the discouraged Mr. Alotta offered it for sale immediately thereafter. Renowned Ferrari collector Greg Garrison most likely read about this car when it was advertised for sale in the Los Angeles Times and realized that it was just what he was missing from his collection. 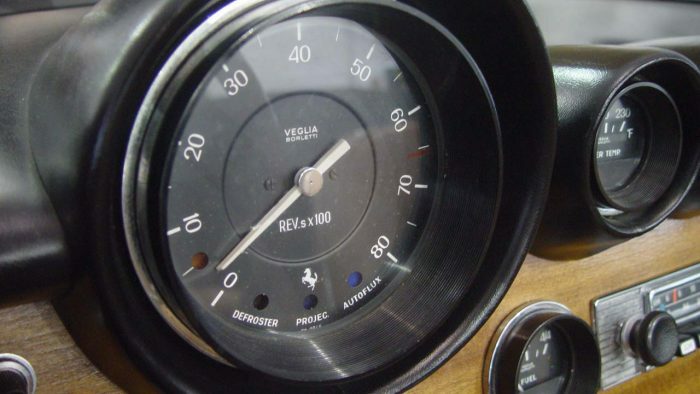 Mr. Garrison, a great client of Ferrari and personal friend of Enzo himself, thought the best professionals to restore and rebuild this damaged Ferrari would be Ferrari and Pininfarina themselves. He shipped the car back to Italy and the original craftsmen at Ferrari and Pininfarina set to work. To repair the bodywork properly, Pininfarina used the last NOS front and rear body pieces they had, most likely pieces intended for use on one of the 365 California prototypes, as they had a distinctive three-lamp set-up on the rear and no pop-up headlights at the front. All mechanical aspects of the car were redone by Ferrari. For color, Mr. Garrison chose the stunning Oro Chiaro (light metallic gold) – the same color as the 1973 Daytona Spider he owned. The restoration took more than two years to complete.